The history of the World Cup between 1930 and 2014 is summarized in the key facts and figures below. 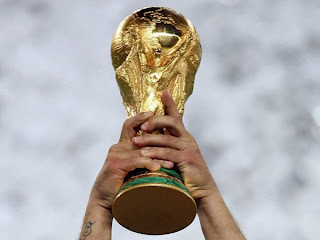 The World Cup tournament has been held 20 times, starting in 1930. No tournaments were held during the Second World War. Winners: Uruguay. Finalists: Argentina. Hosts: Uruguay. Winners: Italy. Finalists: Czechoslovakia. Hosts: Italy. Winners: Italy. Finalists: Hungary. Hosts: France. *Note: There was no Final game in 1950. The group game between Uruguay and Brazil determined the winner, and was effectively the "Final". Winners: West Germany. Finalists: Hungary. Hosts: Switzerland. Winners: Brazil. Finalists: Sweden. Hosts: Sweden. Winners: England. Finalists: West Germany. Hosts: England. Winners: Brazil. Finalists: Italy. Hosts: Mexico. Winners: West Germany. Finalists: Holland. Hosts: West Germany. Winners: Argentina. Finalists: Holland. Hosts: Argentina. Winners: Italy. Finalists: West Germany. Hosts: Spain. Winners: Argentina. Finalists: West Germany. Hosts: Mexico. Winners: Germany. Finalists: Argentina. Hosts: Italy. Winners: Brazil. Finalists: Italy. Hosts: USA. Winners: France. Finalists: Brazil. Hosts: France. Winners: Italy. Finalists: France. Hosts: Germany. Winners: Germany. Finalists: Argentina. Hosts: Brazil. 5: Antonio Carbajal (Mexico, 1950 - 1966); Lothar Matthaus (West Germany / Germany, 1982 - 1998); and Gianluigi Buffon (Italy, 1998 - 2014).